In an attempt to completely redefine and control the anniversary of Martin Luther King, Jr.'s "I have a dream" speech and march on Washington, Glenn Beck launched his very own website - one that attempts to be a conservative Huffington Post. 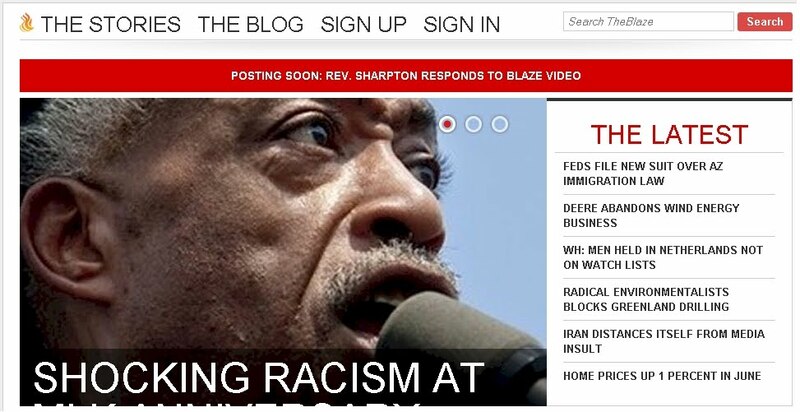 This website, called The Blaze, prominently featured an article talking about how Rev. Al Sharpton was the real racist on the anniversary, and to prove Sharpton was a racist, in the style of Andrew Breitbart, posted a video that illustrated Beck's point, but if you pay close attention to the video you will notice that it is cobbled together to give the appearance that the the counter-march on Saturday was the bastardization of MLK's "dream." Is it any surprise that Breitbart also played the video on his website? Afraid of your fans, Beck? If you watch the video, you will notice that it starts on August 28, 2010 but then it jumps back 10 years ago to 2000 to prove that Beck's march this week was not racist. I'm not the biggest fan of Al Sharpton, but I would have to say that turning the clock back ten years to claim racism today, or to even justify Beck's own event, is just childish and stupid. Can he point to anything that happened that day to prove his point? How about his military love-fest to commemorate a man of non-violence - is that as equally disgraceful as Malik Zulu Shabazz saying that for "caskets rolling in the black community, that we will see caskets rolling and funerals in the white community of our enemy as well today" ten years ago? Was Shabazz even at the event this year? According to Mediaite, Shabazz indicated that The New Black Panther Party had better things to do then watch white conservatives rally outside the Lincoln Memorial. P.S. 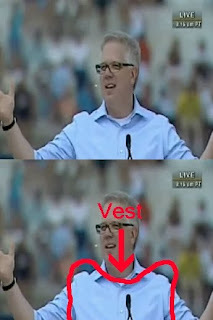 - Palingates had a very good analysis on the just how dangerous Glenn Beck's "Restoring Honor" rally could be referring back to crimes directed towards Turkish-Muslim citizens of Germany back in the 1990s.